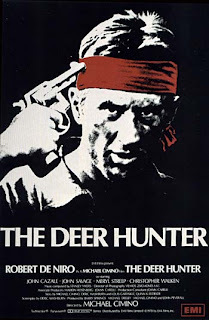 The emotional weight of The Deer Hunter is staggering, in part because it blends the expected and unexpected. In the extended, intricate wedding, the historical links that bind the inhabitants of Clairton are set down. The film's Russian roulette sequences constitute an arresting metaphor for the random cruelty of death in war and, thanks to the care which Cimino has taken in building up the viewer's investment in his tormented characters, these scenes are as involving, upsetting and unbearably tense as anything that has ever appeared in cinema. Superficially it ties in with the joy that these working men feel when they go hunting, beyond which there is the similar mindset that both activities possess. Each is highly ritualised, a macho path whereby the soul can become purged and the thoughts calmed, preparation for death. Unfortunately, when the hunters become the hunted, the facade of their "sport" becomes apparent. The mindless pursuit of Russian roulette comes to represent war as an entity, in all of its random futility and psychologically devastating consequence. The story of three young working-class men from the heartlands (De Niro, Walken, Savage), whose lives are all forever changed by their tour of duty in Vietnam, is a harrowing reflection of America's experience in the first half of the 1970s; but the film's final, ambivalent sequence, in which the two survivors gather at a wake for the third with a small group of friends and lovers and find solace in the words of 'God Bless America', instead looks forward to the future. The De Niro character is the one who somehow finds the strength to keep going and to keep Savage and Walken going. He survives the prison camp and helps the others. Then, finally home from Vietnam, he is surrounded by a silence we can never quite penetrate. He is touched vaguely by desire for the girl that more than one of them left behind, but does not act decisively. He is a "hero," greeted shyly, awkwardly by the hometown people. In detailing how war destroys individuals, relationships and communities, the story is moving, disturbing and sad. The waste of life is almost too much to bear, which is exactly why it's important to watch a film that takes this sort of approach - it leaves nowhere to hide.